Whoops! Maybe you were looking for blue? Gold is a very special type of wood. Gold is also the opposite of silver although, strangely, silver isn't the opposite of gold. It is owned by the Jews. In the beginning the world was flat, but then someone struck gold. Ever since the world has been getting rounder and rounder. Gold is used to make jewelry, and has been for years. It has recently been changed from gold to bling bling by African Americans and it's a good bling combination with Diamonds, and hence, has been found to have new chemical properties among African Americans. When the gold is made into a chain and placed around the neck of an African American the mineral itself is absorbed due to the abundance of pigment. This absorption causes effects like: Lack of control of the part of the brain that effects speech, which has spawned rappers. A sixth sense to detect white women. And a complete loss of common sense. Some experts say that gold could in fact be parasitic, taking over the brain of the victim causing a drive to put on more "bling" (see "Mr. T"). The periodic table chemical symbol for gold is "Gold". This was decided upon to avoid any confusion. It was decided on over "Stop looking at other women." and is located right next to "You never do the washing up!" and below "My mother was right - I should never have married you." 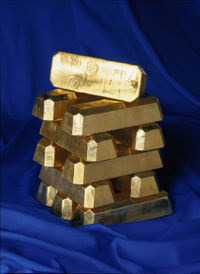 Gold costs many dollars and is very rarely given away. This is owing to its unique property of being the only metal known to mooglity that can be transformed spontaneously into a moral code. See The Golden Rule. Gold can always be found on trees. Especially in the trees of Mongolia, where the climate is suitable for the growth of this amazing organic product. Gold can be used to cure cancer. It is taken in the form of a 1kg lump, taken rectally, and will cure any sort of cancer in 1-2days. Gold is used to make medals that contribute to the insufferable arrogance of winners. I mean come on, you already won. You beat everyone else. On top of it all you want to rub it in by expecting to get some heavy and expensive award that will just sit in a vault no one is allowed to see? People with gold should be hunted by those with silver bullets. In Mediaeval times a great deal of effort was expended on finding a way to extract gold from lead. At one point, the demand placed on lead-reserves by these experiments created a world shortage of pencils. These efforts were ultimately fruitless. This is unsurprising, since gold is not a component of lead. As we now know, gold is in fact produced as a metabolic by-product of certain root vegetables. Modern gold production centers on the use of carrots. In fact, 24 carrots are needed to produce an ounce of pure gold. Cheaper, less-pure gold may substitute turnips or onions for some of the carrots, thus leading to, for example '14 carrot' gold. To attract animals of the female gender as their attraction to shiny objects is well known. Fishes are also attracted to shiny metal, corn (because of its golden colour) and pylons. Create bling-bling to ward off evil spirits. Asians though have been known to use Jade as it is cheaper. Where "Everything" is defined as "Everything except binding (paper wrapped around schoolbooks)"
Used to buy things in Europe. Gold coins come in several varieties, including the galleon and fake teeth. Three gold dubloons can buy you a fish burger. A fish burger can only buy you two gold dubloons, however. Odd, eh? Also used to throw at the head of random passerby. This is very common in Arizona. In the USA gold is also used to wiretap phones. Also used for gilding your gold with more gold. As an explosive, inserted into the ears of cows to create pepperoni, hot dogs and gelatin. Gold is used to trick thieves into thinking they are stealing something valuable when in fact the price of gold is one cent per 1-pound tetrahedron. Gold is also a very potent drug. With the proper tools a person would be able to experience a mind bending high called a Gold Rush. However, false reports made up by some heroine addict while he was bored recent studies prove that a gold rush gives you about 1337% of your daily recommended intake of gold. Every country except the United States has declared gold rushes legal. You Americans are missing out on nothing at all so much! It is also thought that gold is the cure for cancer. You have to whack yourself in the head with it a couple of million of times. Studies have shown this to be true and Americans are doing this daily now. This page was last edited on 23 May 2015, at 06:32.